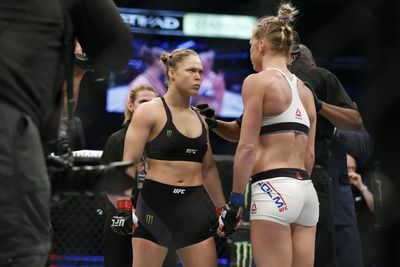 UFC President Dana White likes the idea of a rematch between newly minted women’s bantamweight champion Holly Holm and former empress Ronda Rousey. Speaking at the post-fight press conference immediately after the UFC 193 main event in Melbourne, Australia, White talked about the idea of running back Rousey versus Holm, and it sounds like he’s on board. Holm – who entered the bout as one of the largest underdogs in MMA history – outclassed Rousey from the bout’s onset, landing punches at will and frustrating the now-former champ. By Round 2, Rousey looked exhausted, and Holm continued to pick her opponent apart before scoring the picture-perfect head-kick knockout finish. Despite the massive triumph, Holm isn’t trying to avoid Ronda Rousey part two. She embraces the idea of defending her title by once again facing the organization’s first female champion. She knows it’d silence any critics who may say she just “got lucky” or scored a “fluke” knockout, and she’s aware that her road as a champion doesn’t end with this singular victory.